You are here: Home / Game Recaps / 2010 Game Recaps / Bye week changes nothing, Lions stamped at home again. Bye week changes nothing, Lions stamped at home again. BC Lions fans showed up at Empire Field hoping the bye week had worked out the issues the team had seen compiling a 1-6 record to start the year. In the end it was the Calgary Stampeders who looked rested and fine tuned, as they easily defeated the home side by a score of 48-35. The score flattered the Lions who scored two late touchdowns in garbage time. 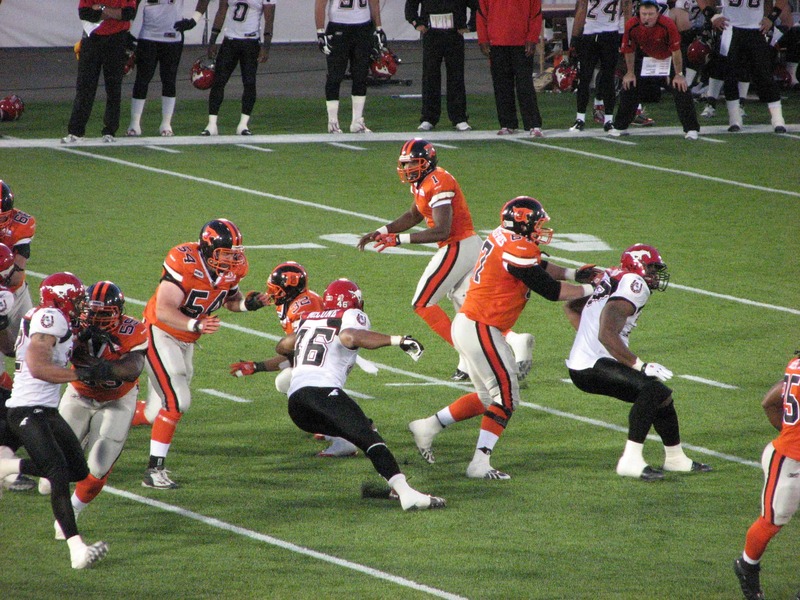 The game started ominously for the Lions after the defence held the Stamps to a field goal attempt. Rob Maver’s attempt was short but was fumbled by the Leos’ Yonus Davis and recovered by the Stamps on the Lions 9 yard line where Burris would run it in for an early touchdown. The Lions did respond on the next series, thanks in part to a great 44 yard leaping catch by Emmanuel Arceneaux to put the Lions in great field position. After Jamal Robertson took it to the one, the Lions needed three chances to get the ball into the endzone, with Casey Printers eventually breaking the plane of the goalline, confirmed by video review. The Lions would take the lead on a Paul McCallum field goal, but it would be their last lead of the game, as the Stampeders started to dominate the line of scrimmage on both sides of the ball, a common theme for the Lions this season. Henry Burris, who threw for three touchdowns and ran for one himself, did his best to keep the Lions in the game in the first half. After an Emmanuel Arceneaux fumble at midfield, Burris tossed the first of his three interceptions in the game, setting up a Paul McCallum field goal. Burris promptly threw another to Dante Marsh and a great catch at the 1 yard line by Simon set up a Jamal Robertson touchdown late in the half, closing the score to 24-20. The Stamps would get a field goal late, aided by a horse collar penalty assessed to Tad Crawford and the Lions were actually in the game at the half, down by just seven points. It was the same old story in the second half as the Stampeders made some adjustments and the Lions couldn’t adjust. Burris worked underneath routes to John Cornish and Joffrey Reynolds at will. On one drive in the half it was all Cornish all the time, and the Lions were at their mercy. The Stamps built up a big lead before the Lions scored twice late. Printers was under constant pressure in the second half as the Lions offensive line continued to struggle, particularly up the middle of the line. The resulting sputtering of the offence kept the defence on the field far too long and Burris and the Stamps seemed to move the ball at will as the defence wore down. Burris completed 20 of 34 passes for 276 yards in the night to go with his 2 TD’s, 1 rushing TD and 3 interceptions on the night. His counterpart Printers finished the game completing 10 of 26 passes for 191 yards. The Lions finished the game with a paltry 44 yards rushing, while the Stamps rolled to 215. A moment of concern came in third quarter when BC receiver Darius Passmore crashed into one of the advertising signs along the sideline, landing on the sign in his neck area. Reports indicated a cut to the neck area of the Lions rookie receiver. After being worked on for some time by medical staffs from both teams, Passmore was taken off the field by stretcher, and and gave the crowd the the thumbs up sign. He was taken to hospital for further treatment and evaluation, but was proclaimed in good shape by Wally Buono on the post game show. The Lions now travel to Montreal for the Labour Day weekend. It’s been reported that Als’ quarterback Anthony Calvillo will not be ready to play and is still recovering from a bruised sternum.